Amazon Price: $119.00 (as of October 18, 2017 6:37 am - Details). Product prices and availability are accurate as of the date/time indicated and are subject to change. Any price and availability information displayed on the Amazon site at the time of purchase will apply to the purchase of this product. 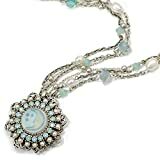 Necklace features a cameo-style iridescent aurora satin glass moon and stars surrounded by Swarovski crystal and pearls. 3 strand chain, one of which features a station chain of crystal and pearl. The glass appears to glow in hues of blue, purple and green.